What is Urban Trial Freestyle? The best way we can think to describe it would be a physics-based platformer – any of you familiar with the Trials series on XBLA should know what to expect here. 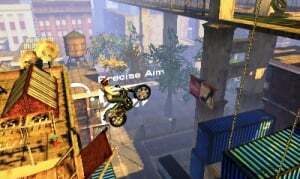 Think of a 2D sidescroller like Mario, but instead of running around, you’re on a bike, zipping in-and-out of ramps and onto platforms, all while balancing and performing tricks. It isn’t as straight-forward as holding down the gas and bee lining it for the finish line, this is going to require a little more finesse, and thankfully it’s pretty darn fun. Even though the proposition of a physics-based platformer may sound a bit complex to the uninitiated, it’s actually quite accessible thanks to a simple control layout. Don’t let us mislead you, persistence and skill will be required to master the courses, but still, nearly anyone should be able to get a feel for things within minutes. Basically, press A to accelerate, then angle the bike back and forth with the circle pad to stay balanced — it should be familiar to Motoheroz fans, but with the emphasis now on physical controls. You can also brake, reverse, and restart at the last checkpoint, but none of it is necessarily required to enjoy the game. 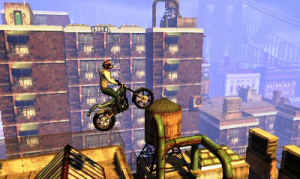 The main mode has you barreling through areas of a city in one of two ways; stunt mode or time trial. Stunt mode finds you traversing a level with as few faults as possible while performing stunts – highest/longest jump, flips, record speeds, etc – at the indicated spots throughout the course. Switching over to time trial will allow you to tackle the same courses, this time solely concerned with getting to the finish line as quickly as possible. In both modes, you’ll be provided with a rating of up to five stars depending on how successful a run you delivered. 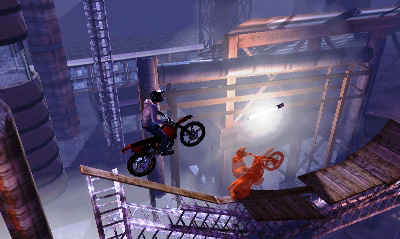 Earning top marks will eventually unlock challenge stages that will have the player participating in less traditional activities. 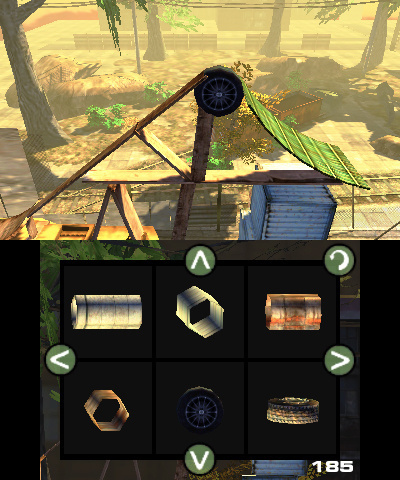 For example, one challenge demands that you tilt the 3DS to manipulate the gravity as you make a run for the finish line. This certainly isn’t easy to master, and it can be tricky to comprehend, but it’s nice to see the technology utilized for unique gameplay mechanics. Another challenge will have you making it as far as possible on a limited amount of gas, where dropping into ramps to catch maximum speed is an integral part of success. Money will be rewarded for progress and can even be found scattered throughout each course in the form of bells. You can spend this money on bike upgrades and rider attire – just don’t expect anything too extensive as there are only a handful of options per category. Also worth mentioning is that there aren’t traditional leaderboards – which is surely a missed opportunity that could have extended the life of the game – though you can set each stunt to display your friend’s records, personal bests, or even world records. These top records will be displayed on billboards throughout the courses for the players that earn themselves a top spot at that particular stunt. To make things a bit more fun, if you use the 3DS camera to capture a profile picture, the snapshot will be displayed on the billboards for everyone to see. Unfortunately during our time with the game we didn’t run into anyone else, besides us, that was utilizing this feature. Hopefully more people will realize this is an option and try it out, because it does seem to add an extra dash of fun to the proceedings. To round out the package is the inclusion of a course creator that gives you an impressive amount of freedom to do things your own way. The shortcoming of this feature is the inability to share your creations with friends or an online community. Nevertheless, it’s sure to add many extra hours of entertainment for those with a creative itch that needs to be scratched. We do have some gripes with the game though, mostly relating to the physics and weight of the bikes, where they don’t feel as finely tuned as they could have been. Many times, we’d land nearly on our backs, ride upside down for a while, and then flip the bike perfectly back on track without wiping out. Even if it was intentional to allow these actions, which wouldn’t really make sense, it doesn’t feel right. Spotty collision detection also lends itself to some of these issues as there were a few instances of bike tires getting lodged in a wall, which forced a restart or reset. As far as the visuals go, the courses are well laid out, and the environments are lush with obstacles and detail, but that could also be part of the reason why the overall visual fidelity is a tad rough around the edges. It’s fine though, the sacrifice of one for another seems balanced enough and none of our cosmetic gripes really affected any of the fun. The 3D is also implemented well, however we often found ourselves turning it down because the sweet spot was hard to keep in sight. Additionally, at times you may experience the occasional disappearance of environmental décor, some shifty shadows, and other buggy visual inconsistencies, but these are mostly unnoticeable while engaged in the action. With twenty courses to tackle, each begging to be played in time trial and stunt mode, it really feels more like forty; even though the additional challenge courses are few, and a bit throwaway, they’re still a nice diversion from the norm. It took us just over four hours to earn five stars on all tracks, and even then we still found ourselves compelled to revisit them to best our high scores. 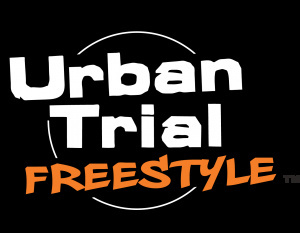 Urban Trial Freestyle is a good game with a few blemishes that keep it from greater things. It’s nowhere near as good as the Trials series on XBLA, but it’s a solid handheld alternative that offers up plenty of fun for the price. If you’re into extreme sports games, high-score setting, or even just looking for an exhilarating time killer, then we can confidently recommend that you take this one for a spin. Good review Dave, I wish that the makers would give us a update to give us a better leaderboard, fix the "driving on the back wheel" and to be able to share levels. Bought it on release day and it's a really good game, there are a few aspects that I would like cleaned up and the addition of level sharing and actually seeing a leader board, the in-game boards don't really tell you much. I also agree that "it’s nowhere near as good as the Trials series", but it's still a really good substitute. Eternal Champions (Genesis) They say it was a good game, It gets a 4/10 for me. Rygar (VCA) got a 5 or 6 but deserves an 8/10. Very good game. Another game i don´t remember. It got a poor calification (like 4 or 5) and it was good,like a 7 for me. That are the unique times NL gave a different opinion in the fun of a game and I preffer to download a good game that have poor calification instead a good calification and its a bad game. Woah, it has a level editor? I must have missed that when I was looking at it on the eShop... if I would have noticed that I would have bought it. Been playing this as well and my thoughts mirror Dave's. It's definitely a fun little game, but there's just a few gripes that stop it from being great. The physics in particular seem to make certain parts of the game far too easy. Aww i bought this day one! Yea it would of been better if there was a better online leader-board and if you could share your levels ver QR - Code or Internet. Wish this had been published before the price went back up. I've got about 30+ hours invested in this game already, mostly playing with the level editor, creating some pretty challenging tracks like the kind that have you raging in Trials HD. I guess you could say I'm fairly hooked on this game at the moment. I've been having so much fun with this game. Great review Good fun and Must play just addicting! Thanks for all the great comments, guys! Glad to see so many of you are getting much enjoyment out of the game. @Humphries90 Sorry about that. We intended to have it up sooner, but you know how it goes sometimes. Life can be one wild ride! Not my review but I do want to jump in and thank you for these comments. Hearing stuff like this means a lot to us (all of us) and reminds us of why we do this. It's a lot of work (from the admins to the reviewers to the news team to the mods) but hearing these notes of appreciation makes it all worth while. So thank you. Though I kind of wish the game sucked so I would have an excuse to save some money. Oh well...goodbye $5 bill! This is the first 3DS game I bought before NintendoLife's review came out. You guys have saved me so much money over the last year with your reviews, I really appreciate it, thanks guys! I bought when it was on sale, having so much fun with the level editor! I made this on level, where if you fall off( there are alot of pits), I made a whole new track underneath the original one! So you get to play two different tracks in one! Yay! I agree with the review, the leaderboards could have been better, apparently I'm not good at the game because I have a profile picture and I completed the game, lol. Definitely agree with this review. With true online high scores and the ability to share user-created levels, this would be an 8 for me. I hope an update arrives soon. Great game. Ragdoll (when you fall off your bike) physics are the best but worst I have ever seen . At some points the rider would go fully into a wall when you crash. I suppose since they do not affect the gameplay, That's fine. @Windy: I agree, this game was a nice surprise, especially being discounted on launch day($5.59, now $6.99). 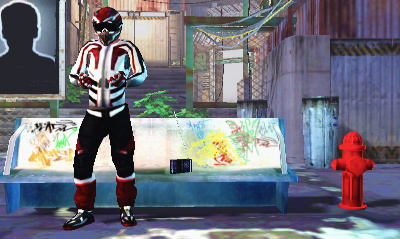 @Bluerobin2 It creeps me out when the wall 'eats' the biker. I took a gamble and bought it while on sale. The character is a bit ugly, but besidesvthat, I have little complaints. With more character and bike personalization, better online leader boards and indeed user made track sharing, this could've easily been a must on a physical copy. And perhaps streetpass ghost sharing or something. I definitely approve of both this game and review! I must ask: I always encounter a bug between this game and Animal Crossing (eShop version). If I start then quit Urban Trials, then switch to Animal Crossing, the latter ALWAYS freezes up for me on a black screen. Then I have to force the 3DS off. Can anybody else try this? I already tried redownloading but same thing. @Philip_j_reed Thanks, buddy! And I know what you mean, all these eShop games are wreaking havoc on my wallet as well! @donmigs85 Ya know, I'm fairly certain that I've switched between the two games a few times now, without issue. Do you completely exit ACNL before booting UTF, or do you boot it up while still in game? Wonder if that could make a difference? @DRL Even if I quit Urban Trials, then start ACNL, it always freezes after the "loading train" appears. Other games never triggered this behaviour. I am using a US 3DS, if that might make a difference. @DonMigs85 Very weird. I tried this last evening and had no issues. I am also using a US 3DS, but mine is an XL - not sure if that makes a difference. Your best bet is to contact Nintendo to see if they have a solution for you. It really is perplexing. Something odd with the save data, I'd imagine. Great graphics for the price! I like the game a lot, but what do I know I drink old kool-aid! @PinkSpider Try doing Sonic. It makes more sense since both this and Sonic are speed based. @DRL I know what you mean. I download games so much that I decided to stop going to Wal-Mart to get eShop cards and just use a credit card. I'll get this the next time I buy a card.